June 22, 2017 By Klint Macro & filed under All Articles, Defensive Issues. We have heard this.… We have said it…. I have taught it. The sentiment is sound and it is good advice. But the situational awareness rainbow can sometimes lead us to a false sense of security, striving for an unattainable goal, or perhaps even a fail. There is more to it than just broad strokes of a colored brush. The color codes of awareness, popularized by the grandfather of modern pistolcraft, Col. Jeff Cooper, quantify one’s level of mental awareness by assigning a color to how much attention one pays to their surroundings. Condition White: Unaware or oblivious to your surroundings. Like the folks who fall into fountains while texting on their cell phones … you can Google that one. Condition Yellow: Aware of where a potential threat may come from. I see a dark area, I shine light into it or I avoid it. I see unsavory folks, so I cross the street. Condition Orange: Alerted to a potential threat where you might begin to implement your defensive strategy. Unsavory fella approaches you and your response is to create distance, yell (posture), and/or prepare a defensive tool. Condition Red: Alarmed to an actual threat that requires you to defend yourself. Condition Black: When you don’t know how you ended up holding a pistol that is at slide lock. The color code “system” is a good way to introduce people to the concept of paying attention to their surroundings. Collecting data using all your senses (including that sixth one) helps you avoid bad situations and unsavory individuals and circumstances. This is a great concept and the cornerstone of all defensive curriculums. Situational awareness facilitates conflict avoidance, or anticipation of the need to deploy a defensive tool. But because we measure our awareness by placing a value on it or attaching a color to it, we can ultimately set ourselves up for a catastrophic failure. Our awareness level cannot be accurately measured with a simple color system. Life is never that black and white. Our awareness is not 360 degrees. If I am in Condition Yellow, Orange, or Red — aware, alerted, or alarmed to a lethal threat in front of me — then I will most certainly be in Condition White as to what is behind me. As predators (and we as humans are engineered to be predators), our eyes are in the front of our skulls, making our vision, including our peripheral vision, approximately 180 degrees. We cannot see behind us. This is not my (or anyone’s) theory – it is a biomechanical fact. So the answer is that we must constantly scan, assess, and keep our head on a swivel, right? Easier said than done in real-world application. Also consider that if we are involved in a Dynamic Critical Incident, we will most likely experience heightened visual acuity in the center of our eyes (often referred to as tunnel vision) and our brain will not perceive our peripheral vision, lessening our sight to approximately 30 degrees. This is actually a defensive positive, as the vision we will have will be higher definition than our brother-in-law’s man-cave TV screen. As we learn and practice the skills of scanning and processing information “in context,” we can learn to do this efficiently, but it takes lots of reps to make this a learned intuitive response. More about this “context” concept in a moment. Many of my students have spoken of how they have literally made themselves sick trying to be “situationally aware” 360 degrees, 24 hours a day, seven days a week…. It is impossible! Having defensive infrastructure in place (especially at home) can help with this. For example, dogs, alarms, spouses on “fire watch” while you take turns sleeping with one eye open … but it doesn’t take long to realize that you simply cannot always live in Condition Yellow. You have to sleep sometime, and most of us do not take a bath or shower with our pistol (unless you are Tuco in The Good, The Bad, and The Ugly). Dynamic Critical Incidents are surprising, chaotic, and threatening enough that the appropriate response is using your tool of self-defense. 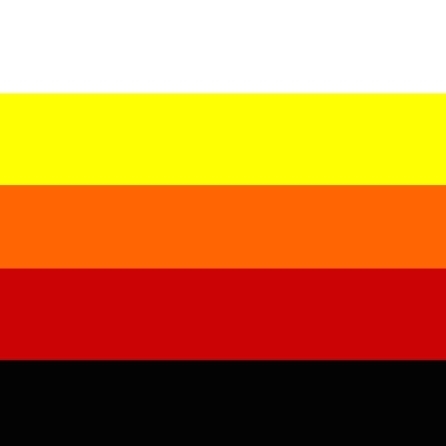 First, accept that you cannot be in Condition Yellow all the time. Do your best, but do not let this reality affect your quality of life or the mental well-being of your family. Take active measures by implementing indoor alarms, motion lights, perimeter alarms, and locks at home. Develop defensive strategies (whether pre-planned or at least on the fly) in the environments you find yourself outside the home. Even a half-assed plan is better than no plan. Have serious discussions with your loved ones and develop defensive plans that are realistic and appropriate to your specific lifestyle. Avoid as much “bad stuff” as you can. If you are as situationally aware as you can be, and you work to avoid all perceived conflict, then if you need to use your particular tool of self-defense during a Dynamic Critical Incident, it must be a complete and utter surprise, where you have very little or no control: an ambush. Counter Ambush Methodology has us preparing for a situation where we are in the maximum amount of danger and have the least amount of control. If we prepare for this worst-case scenario, we will be better prepared for an ambush, and all lesser Dynamic Critical Incident situations, where we are aware or have a higher level of anticipation, will be easier to manage. 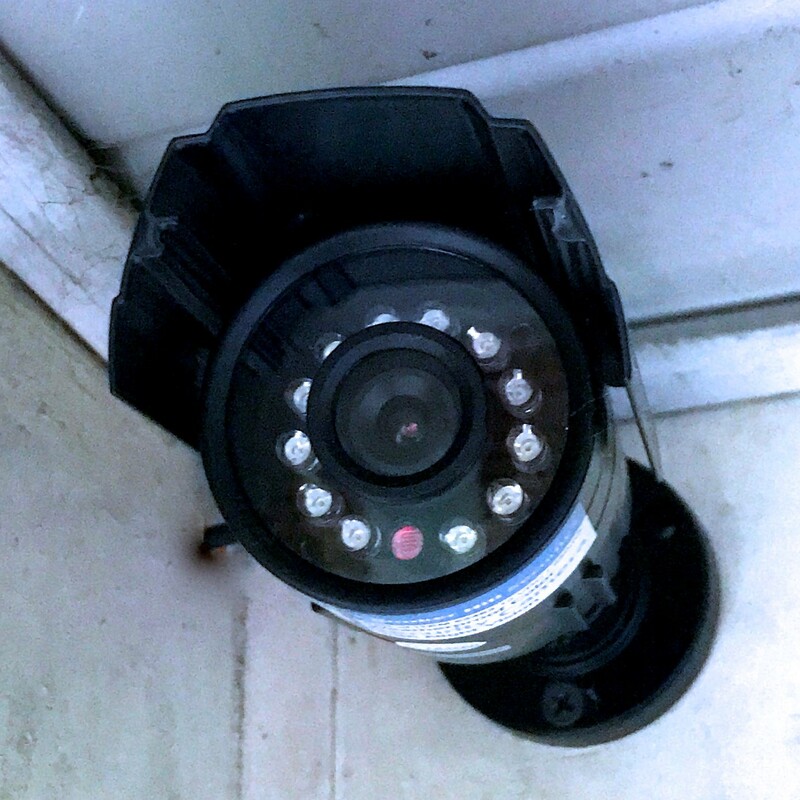 Thanks to decades of dashboard cameras, surveillance cameras, and security cameras, we have a body of empirical data that overwhelmingly illustrates how human beings react, respond, and perform during a Dynamic Critical Incident. Learn to use your tool of self-defense in the most efficient way, a way that works well with what the body does naturally during the extreme stress of a Dynamic Critical Incident. Prepare to use your firearm in a way that takes advantage of a neutral and naturally aligned presentation (Kinesthetic Alignment), that uses bone support and bio-mechanical stops as opposed to muscles, while delivering hits without the use of your sights. 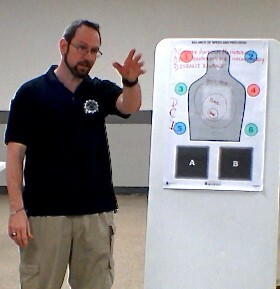 Use a pistol that fits your hand correctly and points accurately when you present to full extension. Muscles require cognitive control. Camera footage tells us that during a Dynamic Critical Incident, there is a high likelihood that the cognitive portion of our brain will be bypassed or at least the processing power will be greatly reduced, therefore we will not be able to muscle the gun, or in many cases see our front sight. Train to deal with the worst-case scenario in context, without a high level of anticipation, in the most chaotic way that you can safely simulate in your particular training environment. Incorporate into your training a startle response, threat-focused sight picture, reflexive crouch, unsighted fire, and lateral movements. Stay focused on the target or process information from your environment and move while reloading or clearing a malfunction. 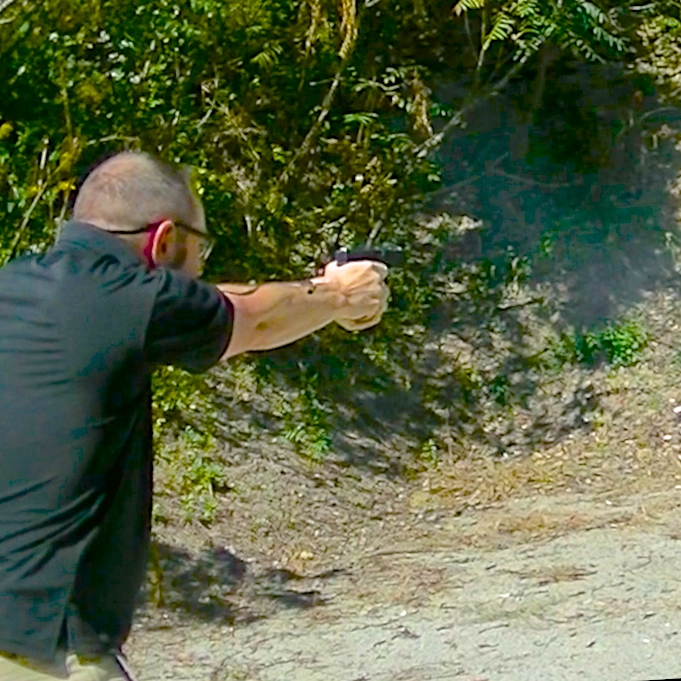 Learn to deliver a volume of fire and manage recoil efficiently. Avoid choreographing the number of shots you deliver. 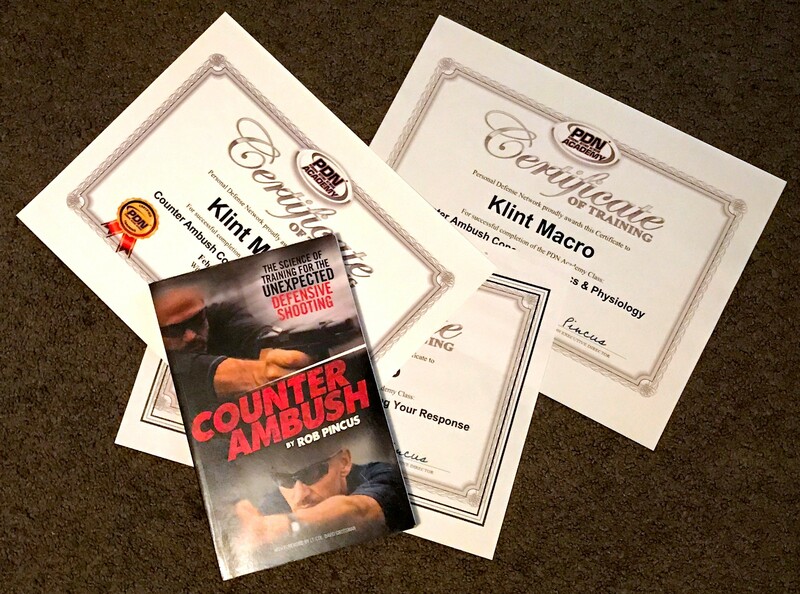 The Counter Ambush book by Rob Pincus and Counter Ambush online courses discuss in detail how we can incorporate these natural reactions into a realistic training agenda. In much the same way that one-dimensional measurements of awareness can lead us to a false sense of security, so can conventional static firearms training. I have seen many extremely skilled shooters completely melt down during a simulated exercise because they have not learned and practiced their shooting skills in a realistic ambush context. Search for “Figure 8 Drill” videos on PDN and you’ll see what I’m talking about. We need to be able to recognize, react, and respond rather than improvise. 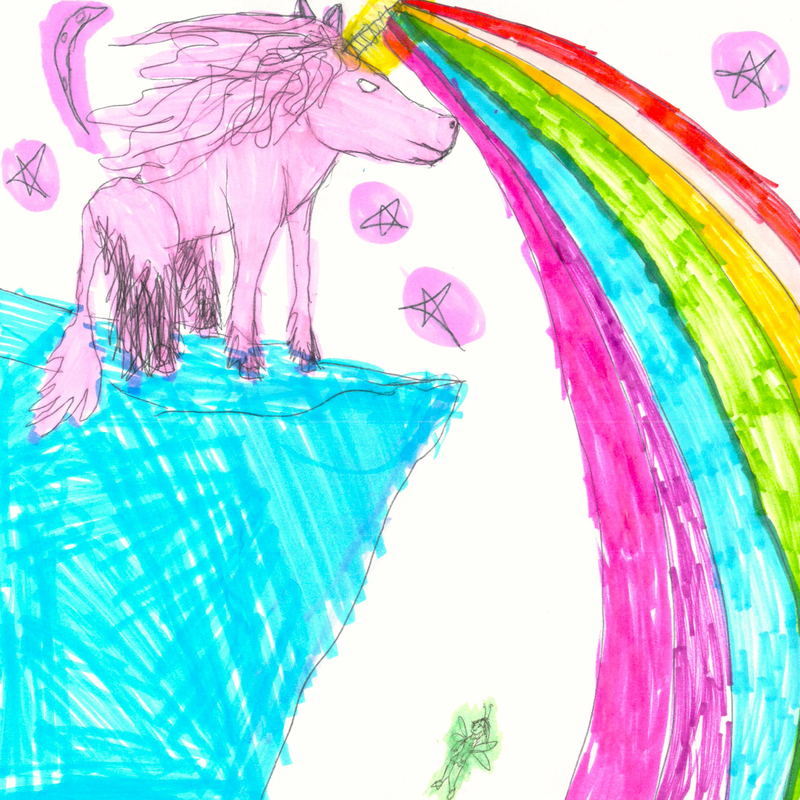 Unicorns are mythical beasts. You wouldn’t waste your resources trying to catch one, would you? Rather than constantly gauging yourself against a subjective measurement of mental awareness, be as aware as you can be, avoid as much “bad” as you can, but be prepared for the worst possible situation. 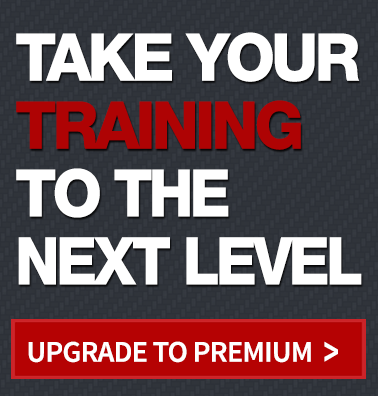 This will greatly increase your likelihood of prevailing during a Dynamic Critical Incident. I was taught years ago white through red, no black. After real world situations in which black took place with others I started adding it. Good to see you have too. When a troop just keeps pulling the trigger on an empty weapon or just sits out in the open without returning fire, black happens. Need to be aware of that. Mark, I agree “Black Happens”. The hope is that we have a learned intuitive response to a learned stimulus and perhaps we will be able to negotiate those times. With what the body goes through physiologically, it is very possible that a blackish condition could happen. That is why it is so important to have FREQUENT and REALISTIC training in order to build the neural pathways in order to “own” the skills necessary to respond efficiently… not improvise or freeze. It takes LOTS of reps to own skills. One afternoon on the range won’t cut it! Thank you for reading and taking the time to comment. Keep Safe and Keep Training!! 98% of USA is Condition WHITE! NO clue of Situational Awareness as I teach in my books. It seems most situational awareness discussions focus on ‘awareness in the moment.’ Not that there’s anything wrong with this, of course. But as the saying goes, an ounce of prevention is worth a pound of cure. I strongly advocate that pre-emptive situational awareness is critical. In other words, awareness of situations to avoid entirely, BEFORE you find yourself in them. Some of these situations are obvious to anyone with common sense, but some are less obvious. It’s one thing to assess a threat once it’s in your immediate environment, it’s another to unwittingly put yourself in a situation where that threat is more likely to happen, or more likely to happen in a way that is hard to discern until the last moment due to obstructions that impair your ability to visually assess your surroundings, etc. Think about where you choose to park your car, which route you take home and what environments one route versus another might take you through. Be aware of multiple escape routes when the opportunity presents itself. I’m by no means advocating walking around in a paranoid state. Far from it. But if we take a critical look at incidents that lead to bad things, many of them started on the “incident train” well before the threat was at arm’s length – they often start with choices we’ve already made, consciously or otherwise. Hammer, that is a great point and often overlooked. GENERALLY speaking we have control of where we place ourself. Safety is not always convenient.